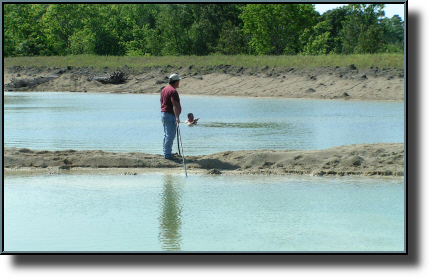 Fishing lake aeration is an up and coming part of today’s successful private fishing lake management. 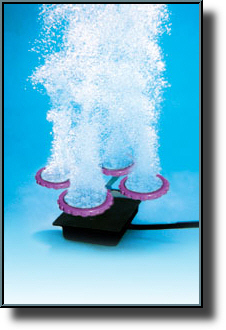 Many types of aeration systems are available today from wind driven to electric. Generally, the most productive and trouble free systems are driven by an electric air compressor. All systems use weighted air transfer lines that supply air to a series of diffusers placed throughout the body of water. Adding oxygen to the water makes for a happier, healthier fish population. Better fish means better fishing and better fishing means more fun! Aeration can help to prevent low dissolved oxygen (DO) levels from negatively impacting fishing lake species populations. In addition, certain types of aeration equipment can effectively mix the water in a pond to prevent water-layer stratification, which can occur in deeper ponds during warm months. Low DO levels can stress or even kill fish, whereas water stratification can limit fish use of cooler, deeper pond areas because of poorly oxygenated water. Anoxic (i.e., lacking oxygen) water does not permit bacteria to adequately process waste products, which then build-up on top of the pond’s bottom sediments. DO in ponds is naturally affected by photosynthesis, temperature, salinity, wind, supplemental feeding of fish, fish density, and fishing pond depth. The natural sources of dissolved oxygen are photosynthesis by aquatic plants and diffusion from the air. Photosynthesis is the process by which plants (especially algae) use sun light to manufacture food. One of the byproducts of this process is oxygen. In a pond, DO is also consumed through respiration by fish, aquatic plants and algae, plankton, bacteria, and a host of other organisms. 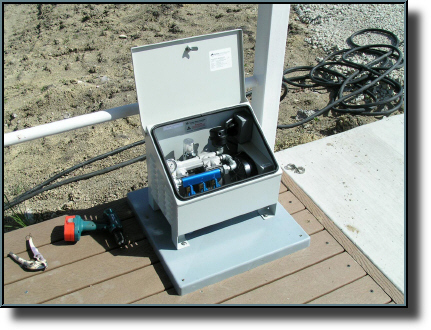 Electric aeration compressor and control box. Weighted air hose in background. The most common DO problem occurs when the consumption of oxygen through respiration exceeds production through photosynthesis and diffusion. During summer, calm and/or cloudy days may reduce oxygen production by plants while fish continue to respire, and at higher rates as water becomes warmer. On occasion, algae or submerged plants in the pond die suddenly and no longer produce oxygen. As the algae or plants decay, bacteria grow and consume even larger amounts of oxygen. In deeper ponds, fall destratification (turnover) can cause the DO level to crash as deep, anoxic water mixes with surface water. Although lake fish can survive short periods of low DO concentrations, prolonged exposure can cause stress or even death. DO can be measured using a a monitor and preferred times to monitor DO are at daybreak and nightfall. Placement of lake aeration equipment. Diffuser in foreground. The general rule of thumb in determining the need for an aeration system is whether the pond contains greater than 1,000 pounds of fish biomass per surface acre. In most bass/sunfish ponds this carrying capacity is rarely exceeded. However, in fed catfish ponds, this threshold is occasionally exceeded by unknowing lake owners who do not harvest fish appropriately. Often, pond owners derive such pleasure from watching their “pets” grow and feed that they fail to harvest sufficiently to keep biomass within the 1,000-pounds-per-acre limit. For example, a pond owner who stocks 250, 6-inch channel catfish in a 1-acre pond, and feeds regularly, is safe within the limit. But in a couple years when those same 250 fish average 4 pounds each (total biomass = 1,000 pounds), a cloudy, summer morning could spell disaster. 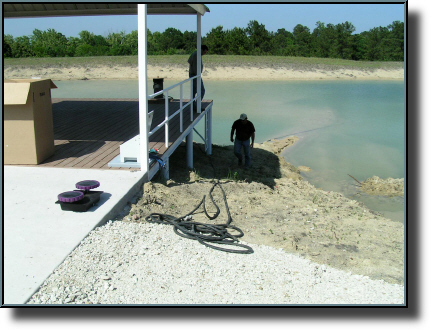 Fishing lake aeration can serve as a pond owner’s insurance against such occurrences. Placement of aeration diffuser in deepest part of the fishing lake. A variety of aeration and destratification systems exist to assist the pond owner. Pump sprayer aerators, surface spray aerators, paddlewheel aerators, diffused air systems, and propeller aspirator pump aerators each bring advantages and disadvantages to each specific fishing pond environment.